Image caption Bha Mgr Harper a' bruidhinn ann an Lunnainn, air thoiseach air àrd-choinneimh NATO anns a' Chuimrigh. 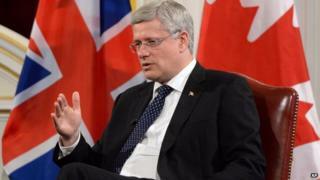 Nochd Prìomhaire Chanada, Stephen Harper, a thaic do dh'Alba a bhith a' fuireach na pàirt den Rìoghachd Aonaichte. Thuirt Mgr Harper nach deadh "ùidhean mòra eadar-nàiseanta" a chuideachadh le bhòt "Bu Chòir" air an 18mh den t-Sultain. Tha luchd-iomairt airson neo-eisimeileachd ag ràdh gum biodh Alba neo-eisimeileach math dhan t-saoghal mhòr. Bha Mgr Harper a' bruidhinn agus cola-deug air fhàgail chun na bhòta air an 18mh là den t-Sultain. Tha an Roinn Chainèidianach Quebec, sa bheil mòr-chuid a tha a' bruidhinn na Fraingis, air bhòtadh dà thuras an aghaidh dreach neo-eisimeileachd, agus tha Mgr Harper, a tha na Thòraidheach, ag ràdh gu bheil e an dòchas gun dèan Alba an aon rud. Bha e a' bruidhinn ann an Lunnainn air thoiseach air àrd-choinneimh NATo anns a' Chuimrigh. Thuirt e gun robh e taiceil ri "Rìoghachd Aonaichte làidir agus aonaichte", coltach ris na thuirt Ceann-suidhe nan Stàitean Aonaichte, Barak Obama, agus Prìomhaire Shìona, Li Keqiang. Coltach ri ceannardan saoghail eile ge-tà, tha Mgr Harper a' gabhail ris gur ann an urra ri bhòtairean na h-Alba a tha an co-dhùnadh. Ach, thuirt e nach cuidicheadh neo-eisimeileachd le feumalachdan dhaoine cumanta san RA, no "ùidhean nas motha gu h-eadar-nàiseanta". Thuirt Riaghaltas na h-Alba gun cuireadh Alba neo-eisimeileach ri tèarainteachd eadar-nàiseanta mar bhall neo-niuclasach de NATO, agus gun cuireadh i barrachd airgid a dh'ionnsaigh cobhair a dhèanamh thall thairis.